"COME TO THE CABARET OLD CHUM"
I first ‘met’ Sally Bowles in the late 1940s when I was given a book of short stories called “Goodbye to Berlin” by Christopher Isherwood. In 1951 I saw her for the first time on the stage of the Empire theatre when Julie Harris, as Sally, starred in the play “I Am A Camera” based on the Isherwood stories. It would be the first play that I would return to see multiple times and I would see everything that Julie Harris AKA Sally Bowles would appear in during her career. In November, 1966, I was working at The Brass Rail restaurant and my friend Ronnie and I would go to see any preview of plays and musicals on Broadway. One Tuesday we went to see a new musical called “Cabaret” and afterwards, as usual, stopped at Downey’s Steakhouse to have a drink after and talk to Frank, the bartender, about the show we just saw. Jill Hayworth was not the Sally Bowles I knew and Joel Grey, as the Emcee, became the focal point of the Berlin stories. In 1972 I took a trip to Australia and it seemed every leg of that journey was showing the new movie musical “Cabaret” and, if I remember correctly, I saw it 7 different times. In this version we had a different Sally Bowles, in the person of Liza Minnelli, who certainly wasn’t the second rate singer/dancer/entertainer that Isherwood knew and wrote about. 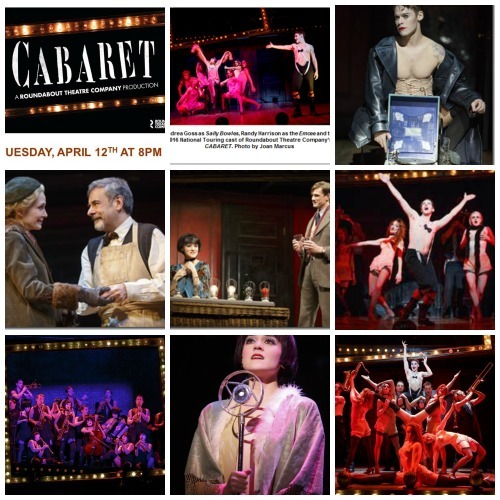 In celebration of the 50th Anniversary of “Cabaret” The Roundabout Theatre Company is presenting the national tour of Sam Mendes and Rob Marshall’s Tony award winning production shown on Broadway in 1998 and then revived in 2014. I am eager to meet the new Sally Bowles, played by Andrea Goss, at tonight’s opening performance at The Adrienne Arsht Center in Miami where it will play until April 17 and then return January 10-22, 2017, to the Broward Performing Arts Center in Fort Lauderdale. It has been 65 years since I first saw Sally Bowles live and I look forward to seeing her again!